Right, time to wrap things up for the day. Cheers for popping by. See you later! On Salah & Firmino: I don’t want to forget Sadio because he was involved in everything, Mo is very good, really greedy.Roberto Firmino not bothered too much. Mo had assist and a goal, both of them did and it was deserved. Important players like that make a difference. Second half Wijnaldum was spot on, Emre Can is a good character. All good characters. On the top four race: We don’t have a normal weekend any more. We want to finish top four, need points for sure. Wenger said after Tottenham it was not only derby defeat but more. Nine points not enough from Arsenal. Tottenham are strong, United strong, Chelsea strong, City champions. So we need to continue like this. Bob: I am a City fan, and no doubt biased, but KDB is consistently doing things I never thought I'd see every week (ahead of having someone like Messi at the club). Not bothered if he wins POTY, I'm just enjoying! Tunde: Mo Salah is really good - the most beastly thing about him is that you cant stop from creating chances for team mates if you succeed in stopping from scoring. He edges Kane and Aguero on that note. On the win: Important for us to get a good start. When you score 10, 15 minutes in, it makes the game easier, less pressure. I’m happy about the start, but we have to keep looking forward. On scoring so many goals: I said in beginning, I always try to help the team. When you score of course you help the team. So I’m not surprised, but we need to forget about the past and keep looking forward. We have more league games and the Champions League. "It was a really difficult to concede so early. I think we dominated the first half, created a clear chance and obviously after the second goal the team was a little down in confidence and self-belief and we couldn't react in second half. "It was too much for us [the two goals] we needed to score one goal to be in the game until the end. "Obviously the second half was really bad. The anxiety in my players was really high. We understand the emotions of the fans but we are in one situation but ok we have to keep going." "The second half didn't show our reaction from January." "I'm convinced. It will be long until the end, we need to recover our mentality and in football everything can change in one or two weeks." 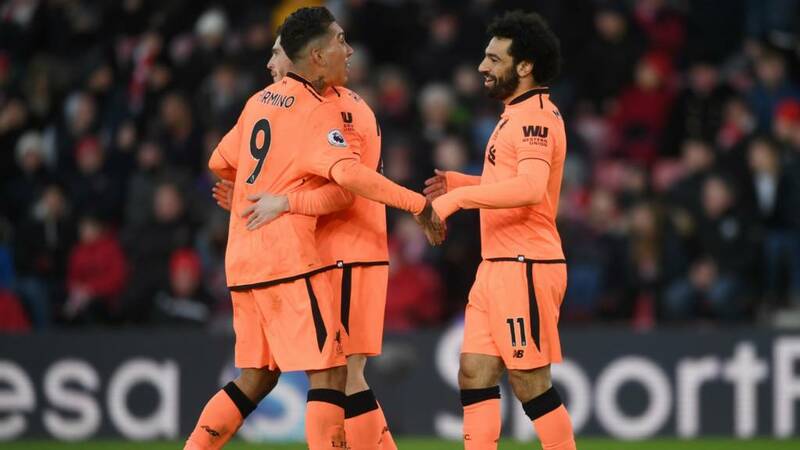 Liverpool boss Jurgen Klopp, speaking to MOTD: "It was not a brilliant performance, not everything worked quite well, the wind was quite strange. It was difficult circumstances and we did the job. That is very important. "We scored early, got the seocnd goal in the right moment and then controlled the game. Kolo: First LFC cleansheet for Virgil van Dijk! Steven: As a Liverpool fan, that game was a much-needed snoozefest! Dennis: A well controlled & mature performance from Liverpool. Now that is how you close out a game! Liverpool defender Virgil van Dijk on getting booed on his Southampton return: "You just enjoy it. It's the only thing I think you can do. I think it is a bit unfair because no-one really knows what happened over the summer and the last few months but I just kept my head down and enjoyed it. "I think we should have scored more. We deserved the win but we should have made it a bit easier for ourselves." Does it hurt to see Southampton struggling? "Definitely. I have a lot of good friends here, I care for the club. It is difficult to get out of the relegation zone but they have quality players." Rob: We sell the talent we pay the price manager not good enough clearly out of depth. Tom: This is what happens when smaller clubs are preyed on my the top six. Clem: People seem to have a misconception about Southampton. All the players they have sold, they have tried to keep. Players have forced they way out the club like refusing to play ie Lallana, Lovren, Virgil. Not exactly selling out soul! Southampton are in trouble when you look at the performance today, the lack of direction, the flatness in second half. Yes they had chances but overall it's been really really poor. It was a nervy start full of mistakes and they find themselves in the position they're in because they haven't been good enough this season. Jon: Player of the year all day is Salah and that's from a Man U fan. You have to remember he's beating players who have already been playing in the premier League and are used to it. Anon:Absolutely dumbfounded people mentioning Kane, Salah and anyone else in same vain as Kevin De Bruyne, still fighting for 4 Cups, 16 pts clear in league and major force in team. Really people wake up. James: Got to be Salah. Does everything, assists, goals, scaring defenders. It's terrible as a player when you're in this predicament, like the Southampton players and it just can't get any worse for you. You just want the game to be over so you can lick your wounds, go away and come in training to get ready for the next game. Neil: Southampton dither on the pitch, in the dugout & in the boardroom. Samuel: Well there goes the Premier League status. Cant see us staying up. The irony being Southampton have literally sold their souls to be in a relegation battle. As easy a win as you'll ever see for Liverpool. Southampton in real relegation trouble. Southampton fans streaming towards the exits as the game enters the 90th minute, who can blame them? A miserable Sunday afternoon at St Mary's for the home support. Ash: I know Southampton have been poor and are having a very poor season but their support is just so silent for so much of the game. All the noise has come from the Liverpool supporters. Andrew: Liverpool couldn't have hoped for a less energy sapping match to play before the champions league on Wednesday, it's been too easy. It's just a training game for Liverpool at the minute isn't it. Southampton are resigned to losing the game and Liverpool are continually taking control. A few boos from the home fans as on comes Dejan Lovren - another former Saint - replacing Mohamed Salah.